Following the inspection we had long conversations with the congregational leadership. True to our mission – 'as little help as possible, but as much as necessary' – we were interested to see them mobilize their own local resources and membership, with iChange only providing support where the local abilities reached a certain limit. It was agreed that the local membership would contribute all necessary labor and sand with iChange providing the remaining building materials necessary. In only a few days the church was completely re-plastered – outside as well as inside – and a new, water-tight roof was installed. The donations received from the congregation of Oberhallau in the end stretched far enough to even support another church congregation in Mackenzie. A couple of years ago one of the larger reformed churches in Mackenzie collapsed when the walls finally gave way as a result of the relentless annual onslaught of the rainy season. Originally built more than 40 years ago the church had to be renovated repeatedly even before this happened. However, there was never enough funding to build sufficiently strong walls that would not yield to the rains after only a couple of seasons. Upon my arrival only remainders of the old foundation were visible in the dusty ground, also similar to the situation one year earlier. The church had to be rebuilt from the ground up, there was no question. Again, we first met with the congregation's leadership to discuss a joint approach to this sizeable project, including certain conditions that required sincere and real efforts on behalf of all partners involved. The actual work was actually almost a non-issue – there always were many members of the congregation present to help, young and old, children, youth and adults, every one contributed wherever possible and whenever needed. If, for example, there was no work for the women for a little while they entertained those present and working with their singing and dancing, cheering everybody on to continue the hard work. Even if temporarily not working, most of the members actually stuck around the construction site as the continuing progress of their church building caused much excitement. Their heartfelt thankfulness for the help and support was clearly visible in their eyes and faces. The church is supposed to be completed just in time before the next rainy season. The members are clearly very happy to not have to congregate under the open sky or – during the rains – in the cramped and confined quarters of one of their member's home anymore. Leadership and members of each congregation, the bible gospel church as well as the reformed church in Mackenzie, would like to express their sincere thanks for all the funding and support they have received. They truly hope and look forward to welcoming members of the congregation in Oberhallau in their new church buildings whenever this is possible. 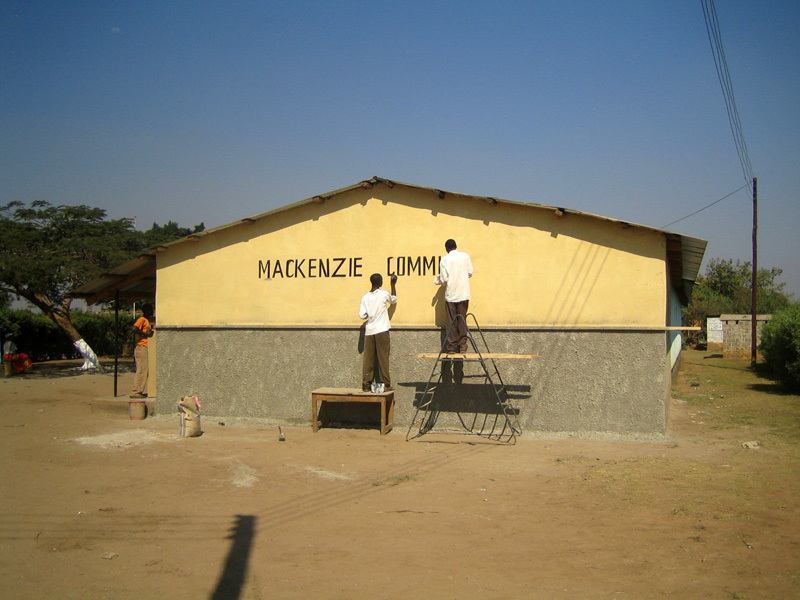 Various tasks were performed at Mackenzie Community School during our visit. 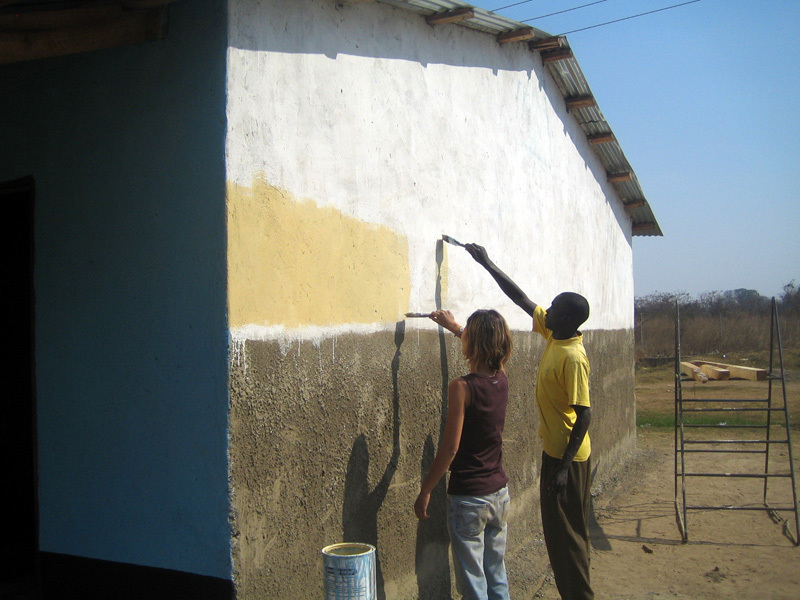 The new classrooms were painted inside and out and new ceilings were installed. As the heavy rains hitting the tin sheet roof during rainy season cause a deafening noise these classrooms so far could not be utilized during that time of the year. In the older classrooms the previously installed ceilings showed major structural weaknesses and safety concerns existed for the first and second graders who occupied these rooms. Lack of funding had so far made it impossible to address this situation; happily, in these classrooms, too, we were able to install new ceilings. 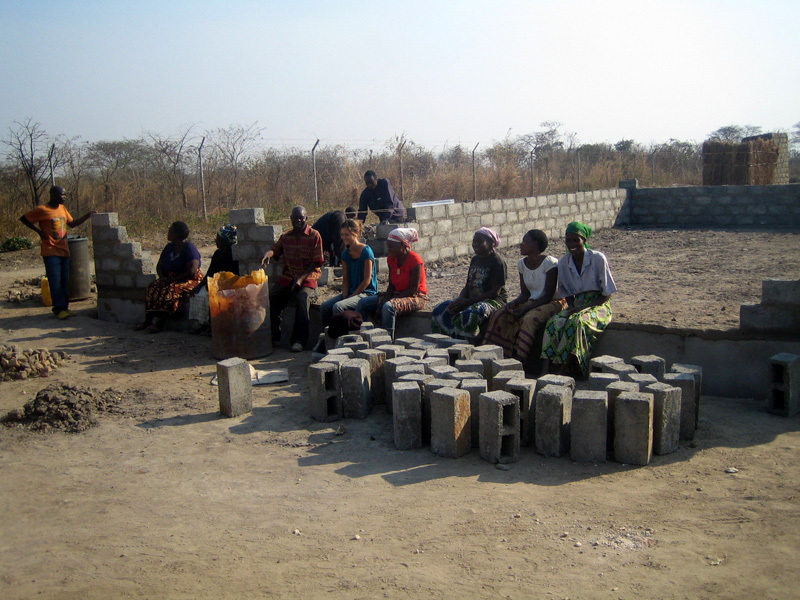 The previously established iChange Microfinance Program continues to progress well. Thanks to paid off loans and interest from last year it was possible to extend second-round financing to three of the previous participants. In addition, three women were newly accepted into our program. Our microloan program, too, is intended to support the participants in helping themselves; it also shows a positive effect on their surroundings in the neighborhood. At the entrance of the community a newly erected sign now informs visitors that they are entering 'Mackenzie Community, Ndola'. Mackenzie is situated at a dead-end road. Its inhabitants often have to walk long distances to even reach a bus stop as no public transportation extends into Mackenzie. In addition, due to the lack of electricity at sunset the whole community disappears into darkness. Often, the feeling arises of being lost and forgotten by the world. Thanks to the large sign that was placed right at the entrance to Mackenzie and is already visible from quite some distance away its people now feel a bit more recognized and 'named'. The community's excitement about the new sign was truly surprising as many came and wanted to say thank you. As so often, it again was surprising and moving to see how much difference such a small thing can make in their lives.